I've always had problems making wefts for my wigs out of loose fibers. I've tried caulk, sewing, hot glue, white glue, ect ect with no real success. If the fibers are too short to use a folding method, I always end up with LARGE chunks disappearing in the brushing process. 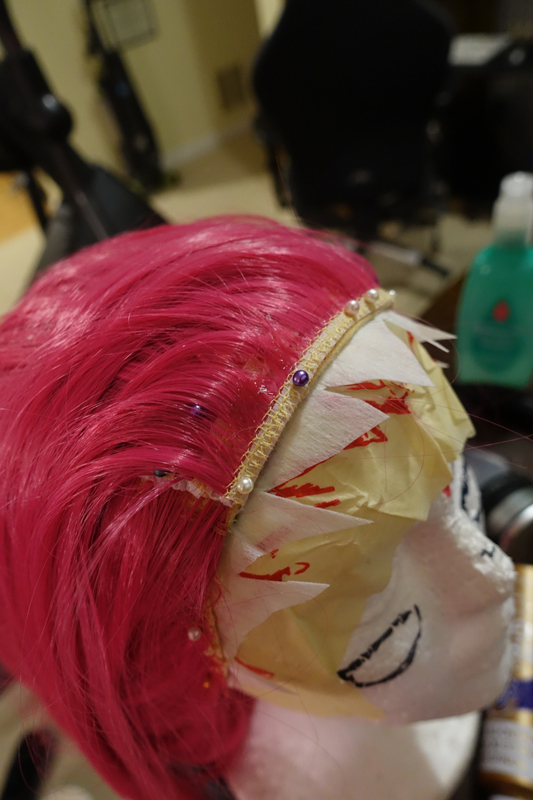 With my Washu wig I had far too much fiber on the skin cap, so I wanted to rip it away to add wefts that went straight back. 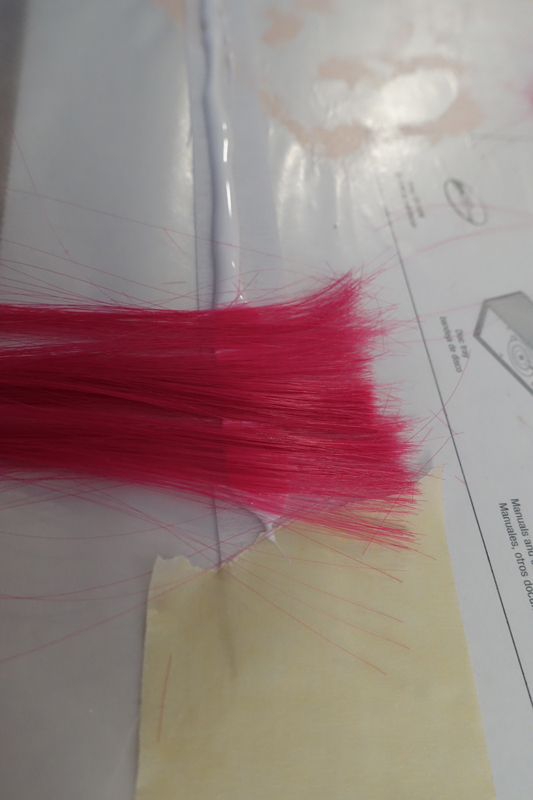 This meant making my own wefts! This entire process was an experiment, but I will say how surprised I was at the results. The wig used here is an Epic Cosplay Dionysus in Raspberry Pink. 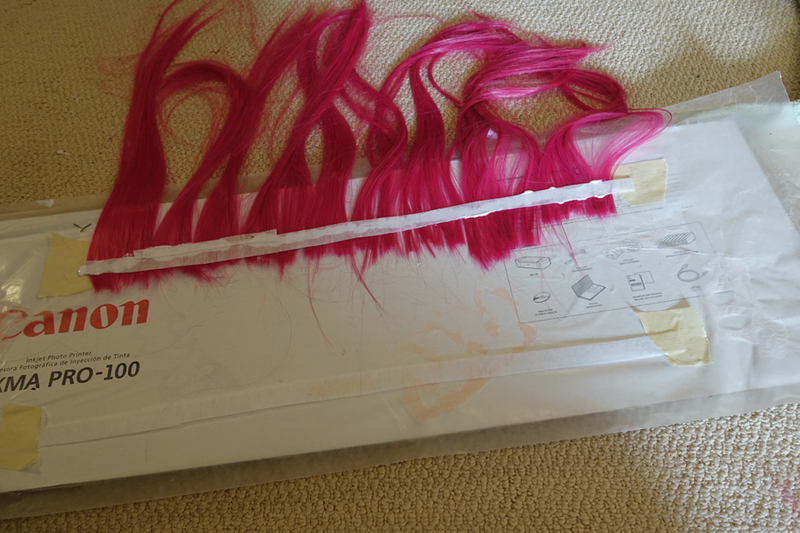 Please note: These wefts will not be good to sew in as trying to sew through the glue will be tear worthy. 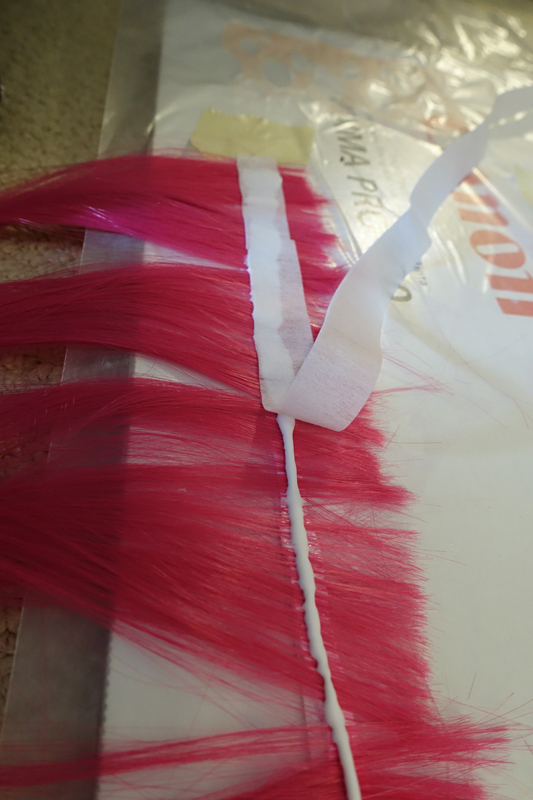 This will require the gluing method, which I've learned is now my favorite way of attaching wefts. 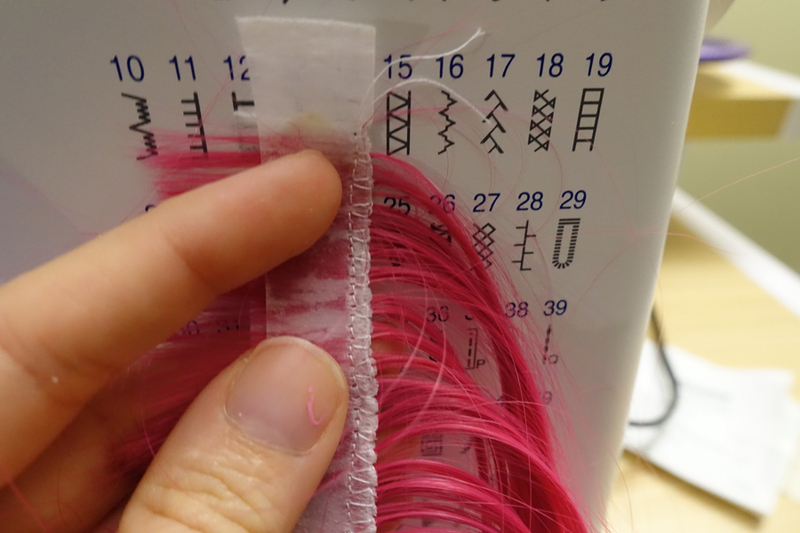 Never use your fabric sheers on wig fibers! No no-name brand, ACTUAL Tacky Glue! Since you're going to be adding glue to this, you'll want a place that is trustworthy for gluing. My favorite glue area is a piece of cardboard that has wax paper taped to it. You can use a table if that is preferable, but you'll want to use wax or parchment paper which the glue wont hold to is a huge help. You'll be wanting long strips that are about 0.5”-1” thick. I'd say make it as long as your fabric/work areas allowed. Initially I had used medium weight non-fusible interfacing as my back fabric, which worked, but was still a little fragile when cut thin. The next test I did was with a non-bleached muslin which was far sturdier and much easier to work with as well. This was better since it had a color far closer to the wig cap, rather than the bright bleached white. Use your tape and extend your strips long and as straight as possible. If it seems like it wants to come up at the middle add a little roll of tape underneath to hold it firm. You don't want it moving too much when you start adding fibers. Add a nice long strip of glue from one end to the other end of the fabric. You want it to be less center and more towards the bottom of the strip without it actually meeting the edge. This ensures that the fibers from where you will cut it thin will actually be glued down. Don't worry if you get glue on your fibers past the strip however, as it dries clear. The source of my fibers for this tutorial was the skin cap that I had ripped off. Whatever the source of your fibers, you're going to want to work in small portions. When you have too much fiber to work with it gets all clumped and it wont get the glue it needs to stay. So start with small little batches and fan them out with your finger to get them as spread the best that you can. Then settle them down in the strip of glue from one end to the next, trying not to put the tops too far above the strip of fabric (like I did.) 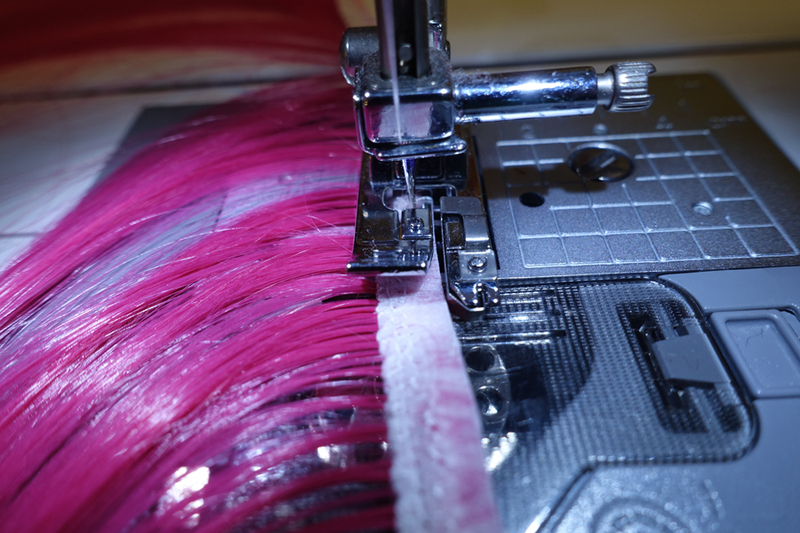 Whatever weft is more than 1/4” above the bottom line gets lost, so you don't want to lose too much! 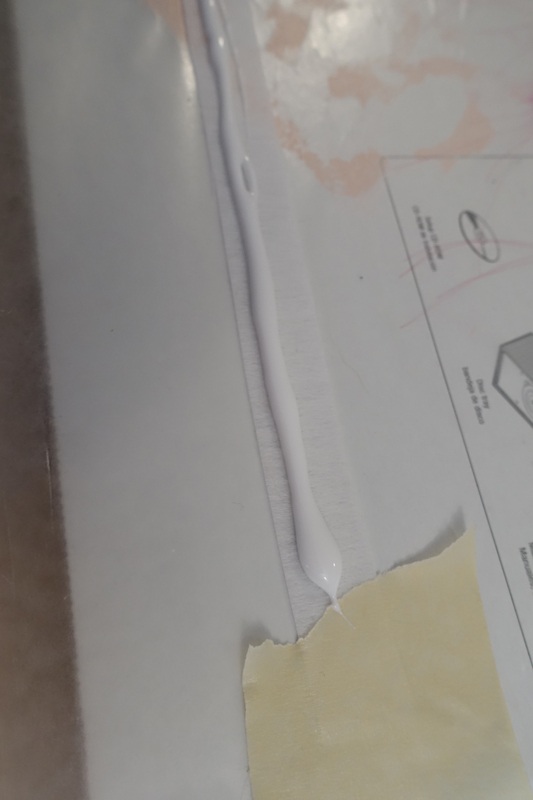 Work your way across the glue line and tap them gently across the line with your finger to push them into the glue or press it further down the line. Whatever fibers you don't get you can give a little press further down to get them tacked there. Remember: If you get glue to your fingers, the fibers will want to stick to that 418X more than the actual fabric, so try really hard to keep your fingers clean! Once all your fibers are down and you've filled the glue line you made, pull your bottle back out and put another line down the fibers. Again, you want to stay close to the bottom edge of the fabric. Also note not to put your spout too close to the fibers though or you'll catch sticking up strays to the tip and it'll give you wiggly, globby lines instead of a straight one! Take the second strip of fabric and from one side to the other press it down gently. Do not force it down just yet, you want to just get it down across the glue. 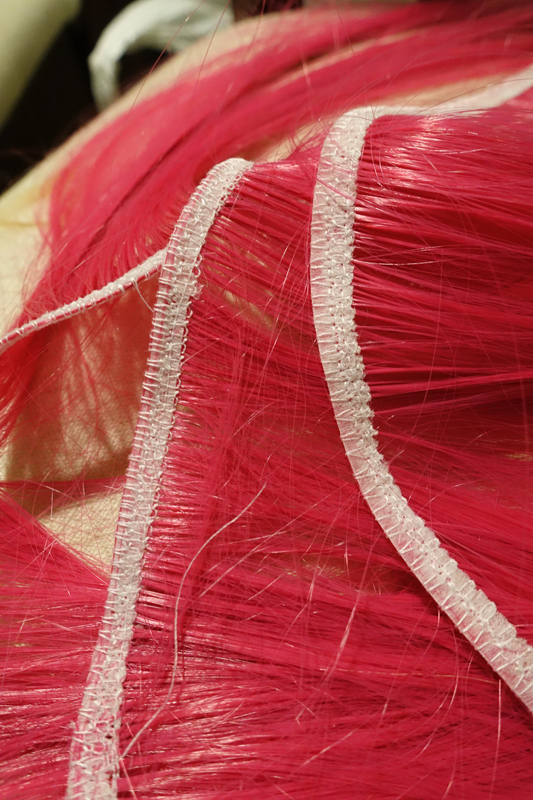 If you press too hard, you'll clump fibers in certain sections which makes unclean wefts. Once it is fully down you can give it more pressure with your finger and really smooth out the glue from one side to the other. Find a place safe from roommates and animals to have the wefts sit for a while. You'll want to get the fibers dry enough that if you touch your top line it'll feel hard to the touch instead of soft and gooey. Please note though that it isn't 100% dry at this point. The side on the wax paper will still be wet, but thankfully it'll be dry enough to move without fibers falling out. So pull the weft up from the wax paper and find a good place for it to hang and dry on the other side. I put my wefts over the hanging arm of one of my lamps overnight. Don't do anything further with this weft until you can't feel ANY stickiness at all. If you do the next part too early, you'll get glue all over your needle! An overnight hang is long enough to do the job right. Time to throw this under your sewing machine! You'll want to choose a thicker sized needle to go through the fabric, fibers, and glue. For this I used a size 14 microtex (sharp) needle and it went through without a hitch. 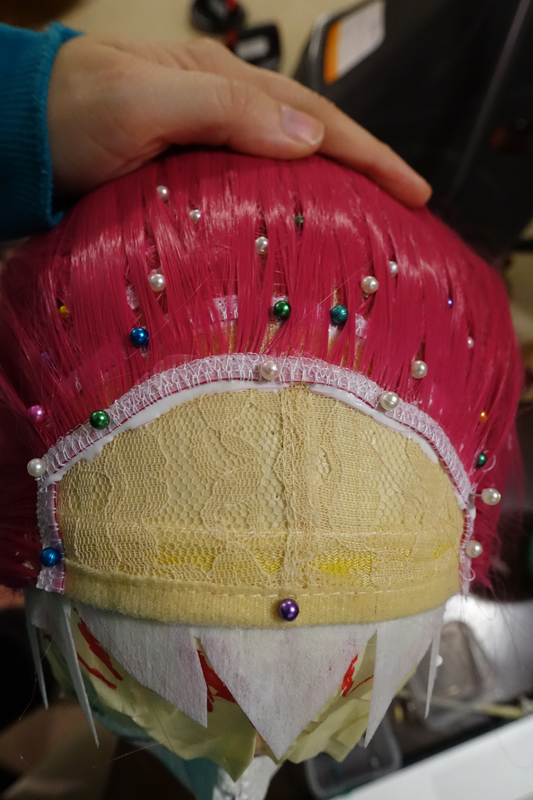 Though I initially used a white thread, I realized a cream thread that matched the base wig-cap was a better choice. 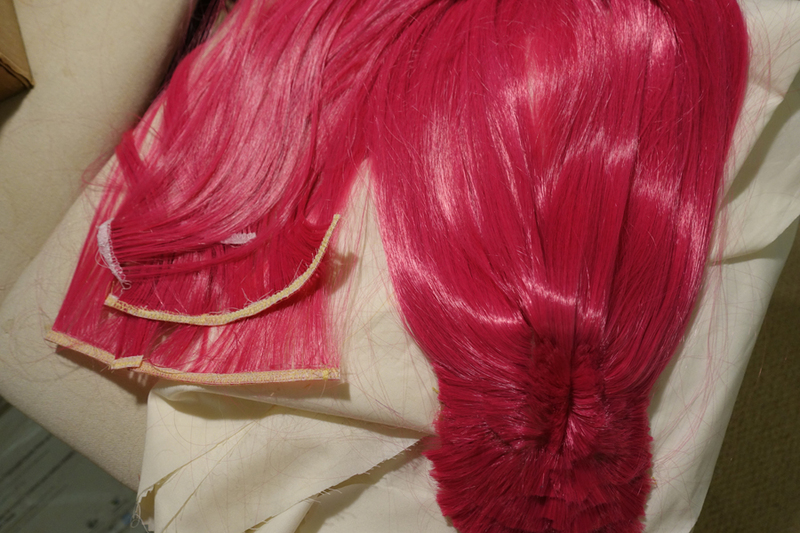 Lighter colors to this light color pink will show through the wig much less. The first pattern I did was this stitch 15 on my machine, but a basic zig zag pattern works just fine. You just want to make sure you get the very edge of your fabric choice and the fibers. Don't make it tooo thick, keep it under 1/4” wide from the base edge of the fabric. 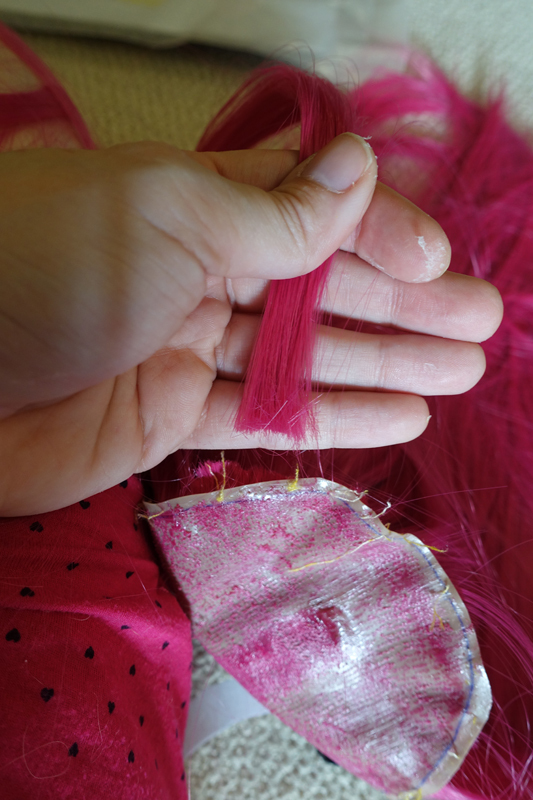 Once the base stitches are sewn, use a set of scissors that is good for both fabric and your wefts. I always advise never to use your fabric sheers on anything BUT fabric, but sometimes you have no other choice. You want to cut the fabric down thin enough that it bends and goes around curves, but thick enough that you don't cut off all the glue if you didn't go far enough down. If you're doing a lot of curves and odd bends, smaller will be better, but don't make yourself crazy or make it too fragile to work with. Once you've cut it down, send it through your machine a final time with a short, but wide overlock stitch to get the other edge nice and clean and keep it from fraying. If you don't have an overlock setting on your machine, a zig zag stitch straight up to the edge plus a straight stitch does perfectly fine. This way if you use basic fabric and you missed some in gluing, it doesn't fray. Congrats, you have completed your wefts! At this point you can now cut them apart into the sections you need for your wig or other project! 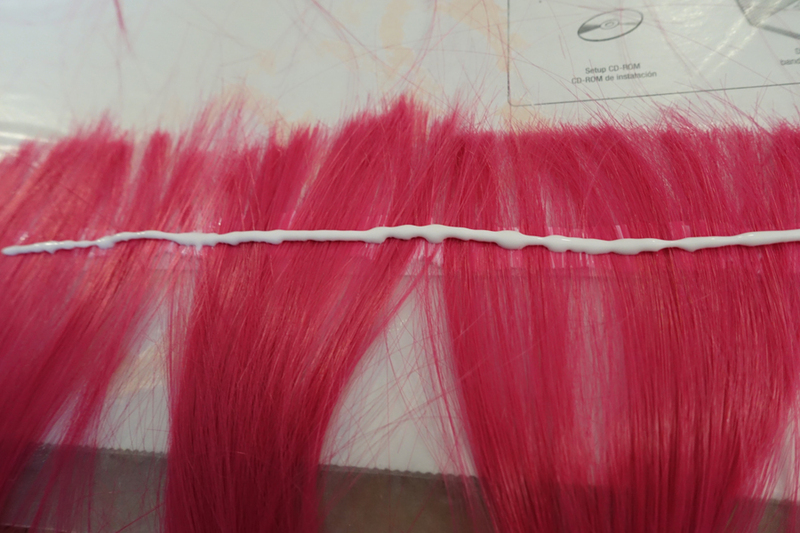 Again, you'll want to glue these wefts into place vs sewing, using the same tacky glue as before. Some pins and a little patience is all you'll need.